S0550. 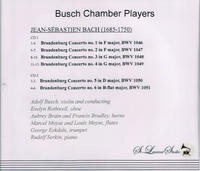 BUSCH CHAMBER PLAYERS: The Brandenburg Concerti (Bach). (Canada) 2–St Laurent Studio YSL 78-110, recorded 1935. Transfers by Yves St Laurent. These venerated performances are offered here in extraordinary sound quality having been copied from pristine early Columbia MasterWorks Pressings which offer remarkably quiet surfaces. "One of the major chamber music forces of the first half of the 20th Century...."